Today is A Very Merry Un-Birthday! Back in March I told you about another bead swap I signed up to do. Another jewelry artist and I were paired to create items for each other using the colors of our birth stones as inspiration. My partner in this swap is Mowse Doyle. Her birthday is in November and her birth stone is Yellow Topaz or Citrine. From the beginning, finding the right materials was a challenge for me. For some reason BONE is not a birth stone! I know. Strange–right? 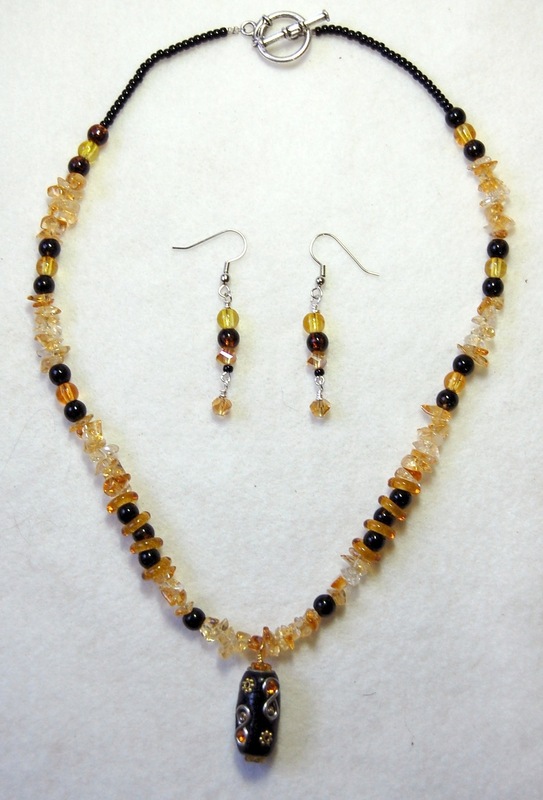 I did have some citrine beads and carnelian chips that were nice and the right colors. These paired well with some black onyx I have from a stash of vintage beads. I also found some Swarovski Yellow Topaz doughnuts that were the perfect color. I knew I wanted to make a necklace, but finding a focal was proving to be difficult. I searched my local bead store trying every stone and crystal for something that would work. Then I found this pretty, leather-wrapped bead with metal and topaz accents. That will work. 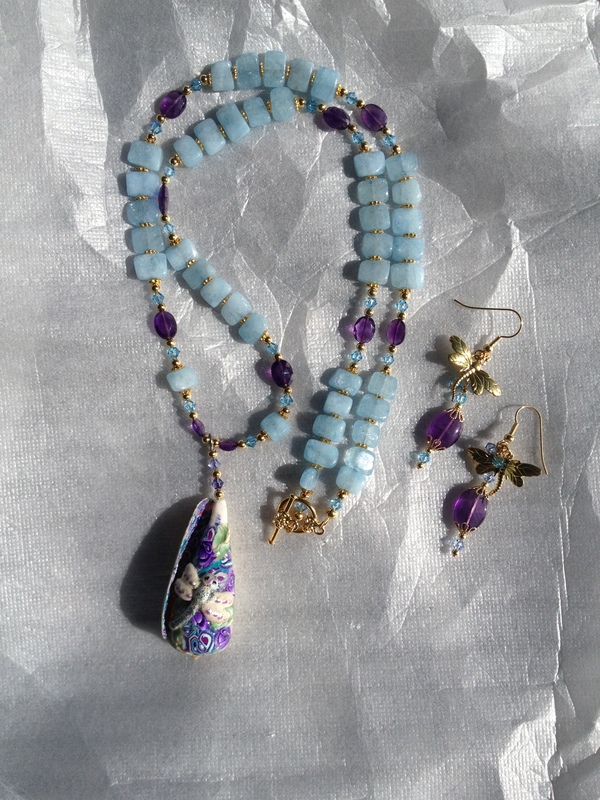 Editor’s note: The pictures I took of the jewelry I sent to Mowse didn’t save for some reason. The pictures of my work are what she sent to me. Thank goodness my package didn’t get lost in the mail! Once I had everything together, the design phase went pretty quickly. I used two of the Swarovski doughnuts to wrap the pendant vertically. (It just didn’t work for me sideways.) I like the cosmic effect of the topaz rings with the onyx beads. Unsure of the length and wanting something comfortable (and pretty) to wear on the back of her neck, I finished with some small onyx beads and a toggle clasp. I kept things simple for the earrings. 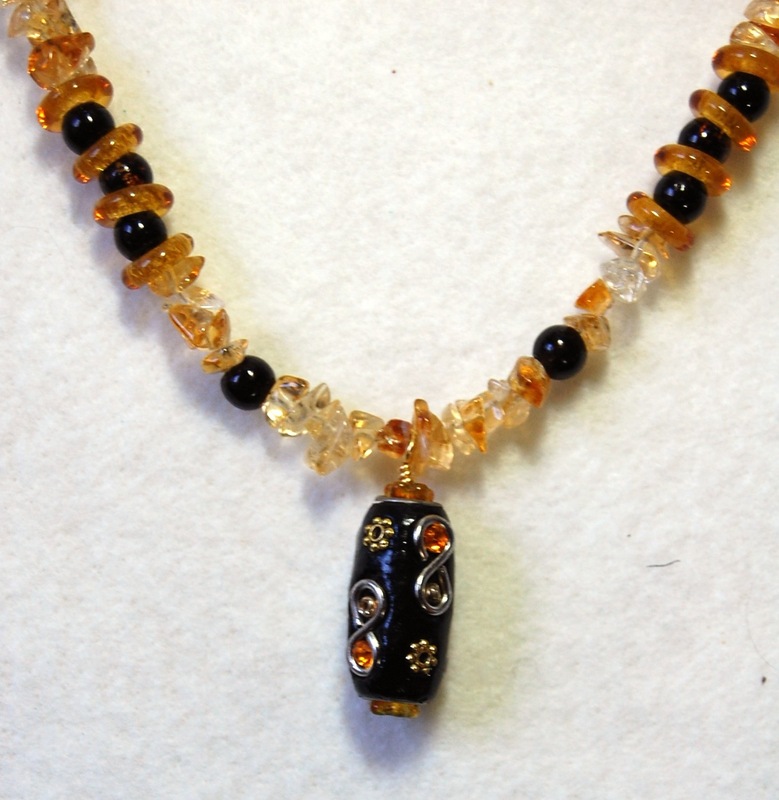 I made a classic vertical bar with the citrine and onyx beads and added some Chinese crystals (I love the unusual shape) and some Preciosa bi-cones, wrapped separately for movement. What do you think? This was a fun project. Creating with a particular color was a lot more difficult than I thought, but un-birthdays are special so I wanted my present to be special, too! I bet you want to see what Mowse sent me. You will have to visit her blog to get the details, but here’s a peek. Thanks to Shelley and Marlene for hosting the party! Want to see what everyone else got? Here’s a list of the links. This entry was posted in Very Merry UnBirthday Swap and tagged cosmic effect, fashion, style, yellow topaz. Bookmark the permalink. Absolutely beautiful! Love how you were able to find a perfect focal for your gift! What a wonderful design. Love it, but then again, that could be because Topaz is also MY BIRTHSTONE. hehehehe. Glad your gift made it on time and so glad you had fun with our little surprise party. I love the colors of your necklace. The gold and back is very classy and classic! 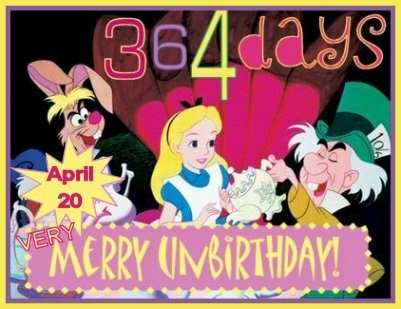 Happy Unbirthday! Very pretty! I love citrine! Susan, you did a marrrrrvelous job lady! I love that leather focal, so unique. I love unique. I know it wasn’t bones but you did a great job with those dang-gone beads and chips! Heehee! Thank you Shelley. You are the best.